Answering an ad placed by the GHOSTBUSTERS to be a participant in the active development of new proprietary technologies -- or, if you prefer, a guinea pig testing dangerous new ghostbusting equipment -- BRYAN WELSH (or, as everyone still calls him, ROOKIE) found himself using the most advanced proton pack ever made in an increasingly hostile paranormal event orchestrated by the empowered spirit of IVO SHANDOR. 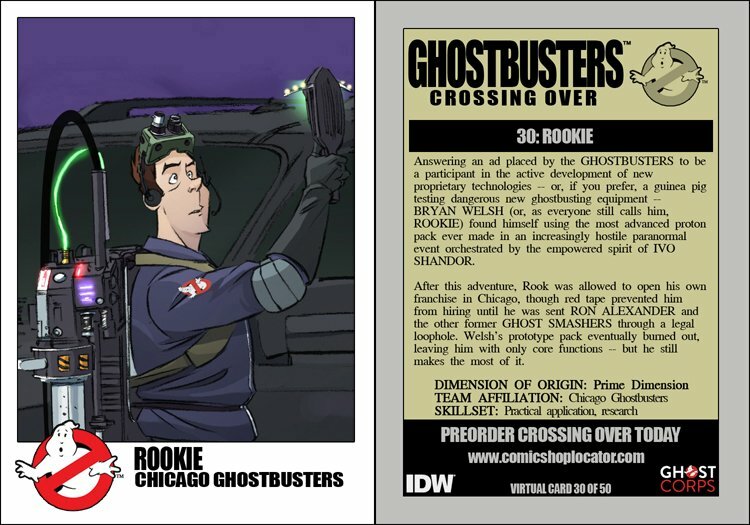 After this adventure, Rook was allowed to open his own franchise in Chicago, though red tape prevented him from hiring until he was sent RON ALEXANDER and the other former GHOST SMASHERS through a legal loophole. Welsh's prototype pack eventually burned out, leaving him with only core functions -- but he still makes the most of it.